The garden is in, here is everything in my main garden area. 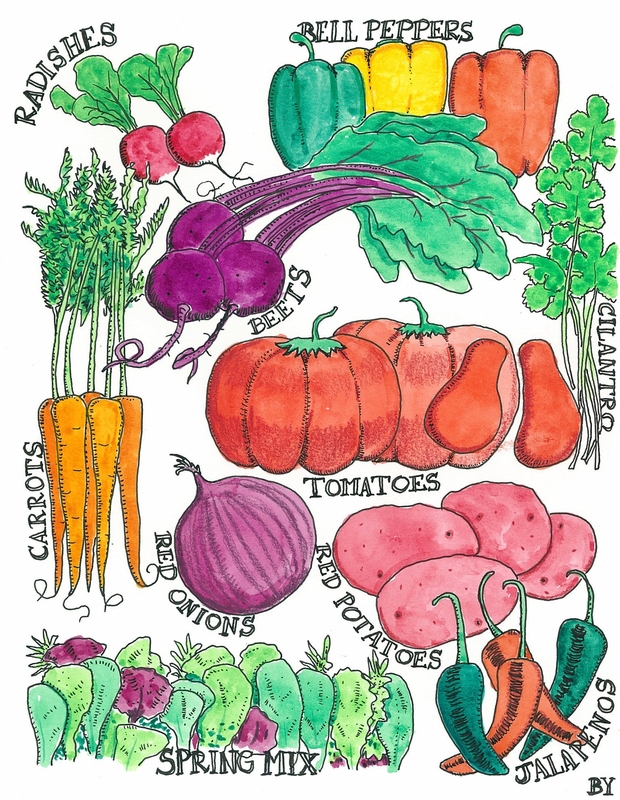 Of course, this is what I’m imagining the veggies to actually look like someday… Some are experimental as we’re always trying new techniques, new varieties and many annual favorites. The only thing missing is some Spanish garlic I planted after the pic. Always organic, always heirloom. There is something about being in the garden especially in the morning. It’s a very happy place. I started drawing when I was about 5 when someone gave me a pencil and some paper to entertain myself. Before long, I was strung out on pens, blacking out teeth and drawing facial hair and eye-patches on models in magazines and catalogs. I hope you enjoy my drawings and doodles. Thanks for stopping by.